This is a genuine street sign from Nelson, New Zealand. 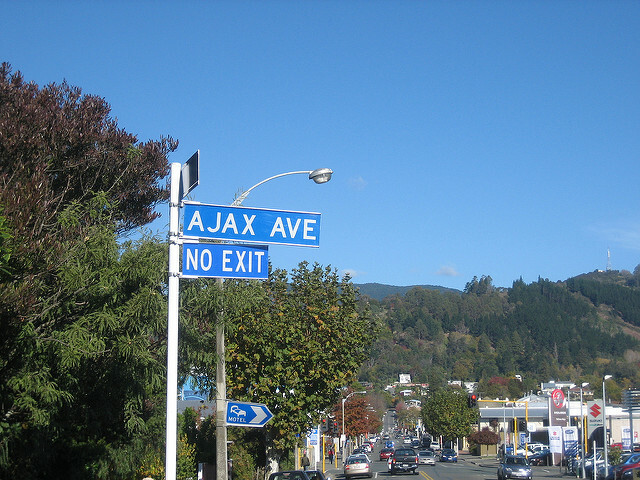 But perhaps its telling us that AJAX really is a dead end and we need something better?! Or that now we've started using AJAX there's no escape?!! For many moons there have been discussions about what we need to do to 'fix' Java. But what might the language look like if we applied all the possible fixes? Many (all?) of the ideas for creating a 'better Java' are not new, and have been talked about many times over the years. Ola Bini produced one list, which included no primitives, enhanced generics (no angle brackets), closures, method references, implementation in interfaces, some type inference, no checked exceptions and non-null variables. This is a good list and mirrors many of the discussions that have been held on this blog. Of course, this JavaNG/Java3/BetterJava language doesn't exist does it? The Fan Fantom programming language is one I've been watching for a couple of months since it first launched its website. Its statically typed like Java and Scala, although there are some dynamic features. I've been meaning to blog about it for some time, but Cedric beat me to it (and its a good writeup too). The basic unit of grouping code is the Pod. This is like a combination of a Java package and module. It forms a key part of the name of any type in the same way as the package name does. But because it is also the module, it is easy to find missing classes - its like every class file knowing what jar file it is stored in. There is also a module level access specifier ('internal'), which is a cross between package scope and proposed 'module' scope in Java. The two main types of type are classes and mixins. Classes are as expected, with single inheritance. Mixins are like interfaces, but can have implementation too, providing convenient and safe multiple inheritance if required. Slots are the contents of classes and mixins. There are only two types of slot - fields and methods. All fields behave as properties, and are accessed via methods. You don't need to manually write the getter/setter, but you can if you need to, such as with calculated fields. Methods are pretty much as expected, except that you have to declare them as virtual in order to allow them to be overridden (and you have to declare override if you are overriding). One key point is that all slots have unique names. This means that a field cannot have the same name as a method. This is a Good Thing, and allows method/field references to just reference the slot name (contrast this with the FCM method reference spec). The totality is a very simple, but consistent, basic structure. The 'new' keyword indicates that the method is a constructor. Note that there was no need to declare the variable type (Str/Int). Declarations of fields still require the type to be specified though. Fantom also supports operator overloading by delegation to methods. Thus, writing a method with a special name will cause the matching operator to be allowed. As a result, there is no need to call a.equals(b). The == operator is mapped to the equals method - this one change makes code a lot neater. Immutability (using the 'const' keyword, although a different meaning to C) is built into the language. Fields and classes can be immutable, as these gain extra power in the language. The main benefit is with multi-threading. The language prevents there being any shared mutable state between two threads. Only immmutable objects may be freely passed between threads. If you need to pass a mutable object to another thread, then it must be serializable (using the built in serialization) and it will be sent to the new thread as a serialized message There is thus no synchronized keyword. Note that both the list and map also have a literal syntax to define initial contents. Note how local variables can be accessed and output from within a string (like Groovy amongst others). Fantom encourages more dynamic coding styles. If you use the dot to call a method (as per normal Java) then the method is compile time checked. If you use the arrow operator, then the method is called by reflection. Further, if the method called by reflection doesn't exist, then this error can be caught (the 'trap' method) which is like the 'method missing' concepts in other languages and enables powerful DSLs to be written. This can also be thought of as enabling duck typing. Fantom has its own API. It does not directly expose the Java API, although you can access it via the 'native' keyword. The benefit if this is the removal of all the bad and broken parts of the Java API. The Fantom authors philosophy is to provide all the useful features of the Java API, but in less classes. Thus, the IO API consists of just 4 key classes, with byte/char operations on the same class, and buffering assumed. Lines do not need a semicolon at the end. A newline will suffice. There is built in serialization to a JSON like syntax. This is actually a subset of the language, and can be used to initialise objects at creation time in normal code. Methods may have convariant returns like Java. But they can also have Self type returns. Methods can be declared to run 'once', and then cache their value. If, while, and basic for loops are the same as in Java. Switch statements are better, as they can't fall-through. The default type for numbers with a decimal point is a BigDecimal equivalent, not a double equivalent. This will mean a lot fewer numerical errors. Fantom runs on the JVM and the .NET runtime. It manages this by writing to a temporary intermediate format, which then gets further compiled to the right bytecode. The website is really good and detailed. Fantom is not Java, it is its own language. Yet, it is many, many ways the natural result of applying all the changes that the blogosphere asks for in Java. Just for that reason it pays to evaluate it closely. Is Fantom a good language? The answer is a qualified yes. At the moment, it looks like a very well designed language I have very few points of contention with it - the main one being there is no non-null support. Minor points include some choices for coding standards (open curly brace positioning, and when to use method parameters). Is Fantom a new language? Not really. It is a consolodation language, which is what James Gosling claims Java was (ie. a language that doesn't invent much that is radically new. Most of the ideas have been seen elsewhere, but Fantom has a particular JavaNG feel about it. What are my key features? Built in modules, immutability and safe threading, closures, and a really great solution to generics (ie. only support them on Lists, Maps and Closures). The local type inference, no semicolons, == for equals and interpolated string are four minor features that make a big difference too. Fantom is worth checking out. Whether it suceeds as a language is up to many factors - it needs an IDE for example, and a lot of luck. The key point for me is that Fantom represents much of what JavaNG/Java3/BetterJava would look like if all our ideas were adopted. And while it has many similarities to Java, there is also quite a sense of difference. Perhaps, the biggest aspect of this is that the APIs are different. But that is perhaps inevitable if you want to get any real benefit from closures and fixing generics (by simplifying them). And that perhaps gives us the definition of where JavaNG/Java3/BetterJava ends and BeyondJava starts. If the language is based around the Java APIs, its a JavaNG/Java3/BetterJava language (eg. Groovy). If the language has its own APIs, its a BeyondJava language (eg Fan, Scala). All opinions welcome on Fantom and the BetterJava to BeyondJava boundary!